Most Potato based recipes are masala types of food. I saw first a sweet recipe using potato in a website long back. So I wanted to try this jamun recipe. 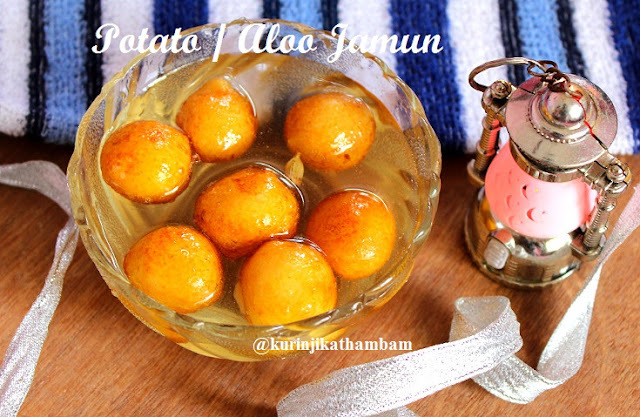 It is almost like normal jamun and definitely worth trying once. 1. Wash and cut the potatoes into 3 or 4 pieces. Pressure cook them with little water for 4-5 whistles in medium flame or till the potatoes becomes tender. 2. Allow it to cool down. 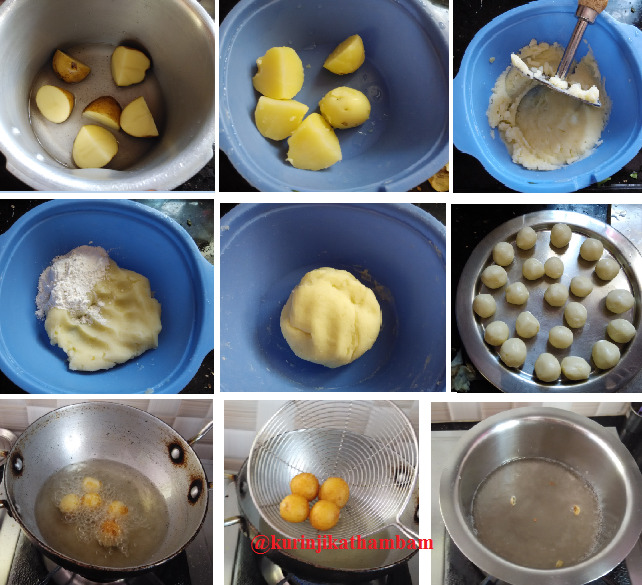 After the pressure has gone remove the lid of the cooker and take the potatoes out and then remove the skin of the potatoes; mash them well with potato masher or grind it into fine paste. 3. Now add the maida, soda and ghee with mashed potato. Knead well for 5-8 mins or till the dough becomes soft. Cover and leave it for 5-10 mins. 4. Then grease you hands with oil and make small balls from the dough. 5. Heat the oil in a pan in a medium flame. Then add the balls and fry till the balls become golden color. 6. Drain the oil and keep it aside. 7. Meanwhile, mix the sugar and water, heat the mixture in a medium flame till the sugar dissolves completely (or 10-15 mins) and add the cardamom powder. Mix them well and switch off the flame. 8. Now put the jamuns into the sugar syrup and leave it for an hour and serve. Tasty and yummy Aloo jamun is ready. cute luking jamuns.hope they tasted well..nice step wise pics.